The Famille Dupont Family estate consists of 30 hectares (74 acres) of orchards in Normandy, in the heart of the Pays d’Auge region. The estate produces ciders, pommeau and calvados. For more than 25 years now, the Estate has resolutely followed a path towards high quality. By drawing on the best techniques used to make cognac and its great blends, Etienne Dupont has studied, tried out and refined his cellar work to reach the same levels of elegance and expressiveness as found in the best wines. Some of these techniques, such as manual sorting of the apples, and even working with an oenologist are found only very rarely in the making of cider and calvados. But just as for wine, the quality of the apples is still the first essential step. The apples are harvested, crushed and pressed, the juice is fermented then double distilled over six months. The distillate is then aged for 5 years in toasted oak barrels, 25% new oak. The result is a 42% ABV eau-de-vie that is bright golden in the glass with an intense nose of toasted oak, anise, vanilla bean and white tree fruit. The palate is sweet and soft with notes of juicy apples. 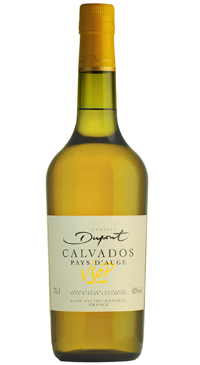 Enjoy as an aperitif on its own, over ice, or with a drop or two of water to let it release its aromas. Also makes a great digestif when served between 20-22°C.